The Beloit College “Mindset List” for the entering class of 2016 notes: “outdated icons with images of floppy discs for “save,” a telephone for “phone,” and a snail mail envelope for “mail” have oddly decorated their tablets and smart phone screens”. 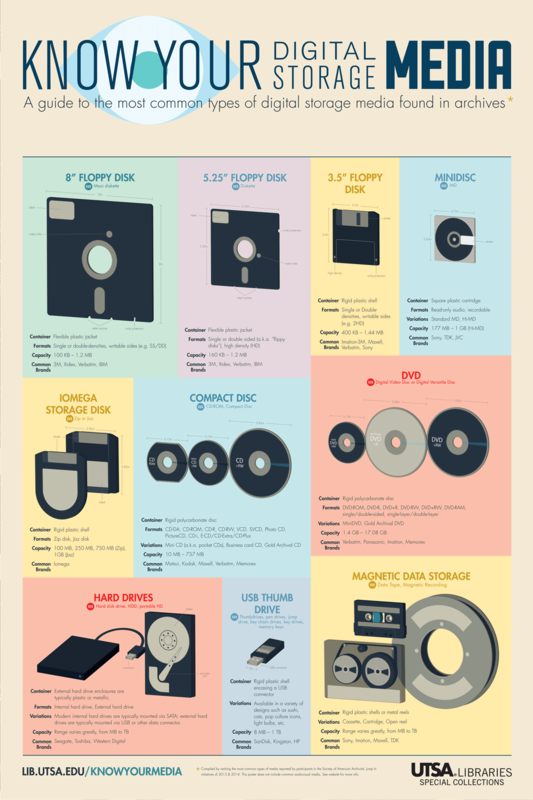 We are living in a time where most undergraduate students have never seen a physical floppy disk, and many types of physical storage media, like CD-ROM, are rarely used. As a result, student workers in archives and special collections may not quite realize what digital media they have in front of them. The full-sized poster can be downloaded from the Know Your Media website. This project won in the category of Electronic Bibliographies/Booklists, Materials promoting Collections, Services, or Resources, $10,000,000 – $15,000,000 at the 2016 PR Xchange Awards. View the full listing of award winners (PDF). I have on the wall near my computer the sales page for what I think was my first computer: APL-115- 128K system: $2,165.009 — plus EPS-107 FX-80 printer $699.00 — all together the project cost $3949.09 — plus $145.00 more the next week for something else not on that list. I found a box of little bits of this and that — they look like the bits in the section above…. …. let me add one other part — I bought that computer, etc., on 3/5/83. Yes, 1983! No, I don’t have it any longer!